With a few days between the Blackhawks kicking off the Stanley Cup Finals it gives everyone a chance to reflect back on the season while anxiously awaiting its sure to be exciting conclusion. There have been many storylines in Chicago this season, one of the more pleasantly surprising ones is the play of Bryan Bickell. As he continues his amazing playoff run one has to wonder, has Bickell played himself out of the Blackhawks payroll? Bickell entered the season as one of the character third liners on a Hawks team that is filled with talent. Bickell is well liked in the dressing room and up until this season was considered a serviceable bottom six forward. Over the course of the regular season Bryan Bickell scored 9 goals and 23 points in 48 games, one less point than he produced in 71 games the season previous. Bickell’s .48 point per game average would equal out to 39.36 points prorated out to an 82 game schedule. While impressive those numbers are not eye popping, however they are rather outstanding when you consider that Bryan Bickell averaged just 12:48 of ice time per game. 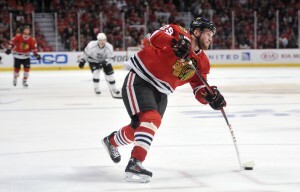 In the 2013 playoffs Bickell has been even better with 8 goals 5 assists for 13 points in 17 games, including two game winners. With all contracts on the books for the 2013-14 season the Blackhawks will have just $2.09 M of cap space. In their cap conundrum they have 6 unrestricted free agents: Michal Handzus, Viktor Stalberg, Jamal Mayers, Michal Rosizal, Ray Emery and Bryan Bickell. Nick Leddy is also a restricted free agent. Bickell has played well enough to command around the $3M mark and his value seemingly increases every game. Bickell has credited Hossa and Toews for helping his offensive game come along and with his already imposing (6 ft 3 223lbs) physical game, he is sure to attract the interest of several teams. While Chicago could make some moves to re-sign Bryan Bickell, the fact that Corey Crawford is an unrestricted free agent in July 2014 and will be needing a handsome raise from his $2.6 M salary, severely limits the Blackhawks ability to throw money around this summer. With the recent struggles of Ryane Clowe it seems Bickell would be behind David Clarkson and Nathan Horton in teams interested in big wingers who can provide offense. As the Stanley Cup Finals get under way this week it will be a great series to watch and hopefully another series where Bickell is the difference maker for Chicago. While many teams are salivating and the thought of adding him to their roster, Chicago is just happy Bickell is helping to lead them right now.